Joe with Tommy Holbrook at his 94th birthday party. "Ladies and Gentlemen, the entire cast and crew of the Kelly-Miller Circus would like to dedicate this performance to the memory of Mr. Joe Vani, America's Oldest Circus Clown, who passed away this morning at the age of 94." I have just received a phone call from Mike Lorenz, Joe's Great Nephew. Uncle Joe passed away quietly this morning at around 1:45 AM at Meadowbrook Nursing home in Montgomery Ohio. Joseph Robert Vani was born June 12, 1913. he is survived by one brother, Frank Vani in Florida and a Niece, Marlene Lorenz, of Twin Lakes Wisconsin. There will be memorial service Sunday, March 30th in Twin Lakes. Burial will be in Twin Lakes Wisconsin. Thanks for the thoughts, good wishes and prayers for Joe and his family. 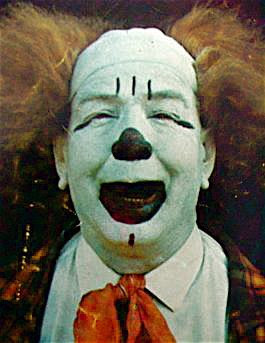 America's oldest living circus clown has passed away, far from the big top, in an Ohio convalescent hospice. 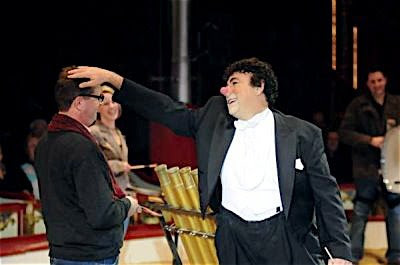 Famed veteran circus clown Joe Vani passed away at 1:45 AM March 21 while a patient at Meadowbrook Care Center in Cincinnatti, Ohio. 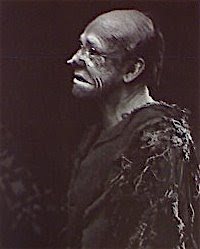 He was 94 years of age (June 12 he would have turned 95). 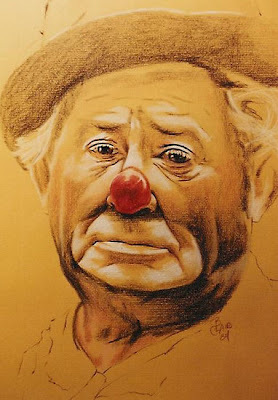 Referring to his own advancing years in the business as a professional circus clown, Vani once confided to a friend "I'm so old I entertained God while he made the earth! " Actually, Joseph Robert Vani made his earthly debut on June 12, 1913, into a Chicago, Illinois family of three other boys. Joe's Dad was a fireman who was trampled to death by runaway horses en-route to a burning building. Joe's Mother was unable to care for the boys alone, and Joe was sent to an orphanage until the 6th grade. He applied himself diligently, working to help out his mother, and eventually took a job with Western Union, delivering telegrams to (among other places) the stage door of local vaudeville houses. As Joe explained, " I'd tell them the telegram had to be signed for, and that's how I got to meet a performer or go backstage." A friend told Joe the stage door manager was skipping his tips, and, as Joe seemed interested in the entertainers and show business, he should go to work for the hotel where the performers all stayed. Joe was hired at the hotel as a bellhop. Kenneth Waite was living at the hotel, and one of Joe's duties was to wake Kenneth every day at 3PM, and give him the daily newspapers and an ice cold bottle of Coke. One day he noticed a 'third party needed' notice posted by Kenneth Waite on the hotel bulletin board. Joe asked Waite about it, was told it required athleticism, and Joe informed Waite he was very athletic. Kenneth Waite gave Joe an audition at the local athletic club. Chester Sherman, Waite's partner, was looking on. "How old are you?," asked Kenneth Waite. Joe told him he was 18, but Waite didn't believe him, so Joe got his mother to write a letter of confirmation. 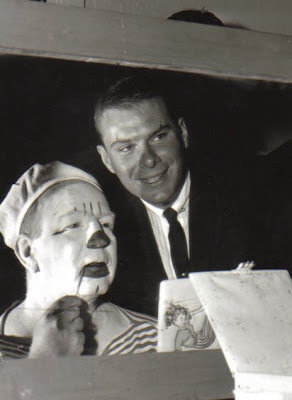 Joe joined the act, but eventually Kenneth Waite took a hotel job, and left show business. 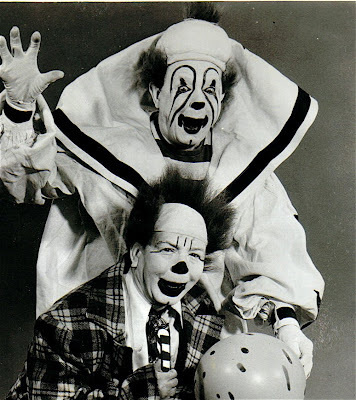 Chester and Joe were all that remained of the Kenneth Waite Trio, so they carried on together for awhile with several partners, finally turning to clowning in 1937 as 'The Sherman Bros.' (Chester had suggested calling themselves Vani & Sherman, but Joe thought 'The Sherman Bros.' sounded better). For the length of their 38 year career, everyone believed the two were brothers. Joe recalls, "Chester was very good to me all those years. We never had a serious argument." 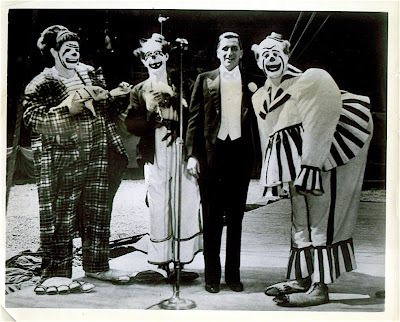 The Sherman Brothers appeared throughout the United States for over 38 years (1937-1975), touring with the Medina, Howard, Carden-Johnson, and Polack Bros. Circuses, as well as the Orrin Davenport and other Shrine Circuses. In addition to their regular show obligations, the duo voluntarily visited hospitals throughout the U.S., Canada, and Mexico, tirelessly entertaining both patients and staff. 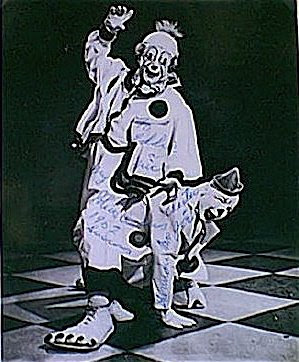 Joe & Chester clowned with Clowndom's finest, including Emmett Kelly Sr., Otto Griebling, Felix Adler, Shorty Flemm,Harry Dann, Freddy Freeman, Paul Jung, Larry Cross, Peluza, Chester "BoBo" Barnett, and countless others, remaining active through the years until Chester Sherman's passing in 1976. 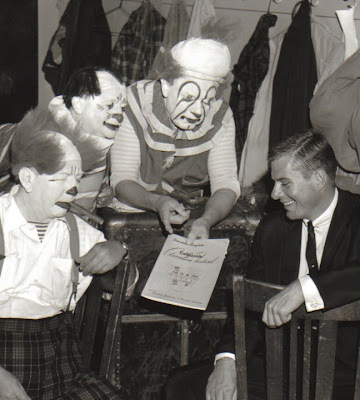 Joe continued clowning with several new protege partners until 1980, when his eyesight caused him to pack up his steamer trunk for the last time. 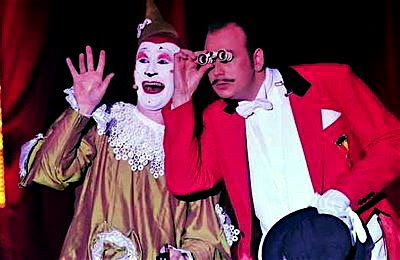 In 1995 the Sherman Bros. - Joe & Chester - were inducted into the International Clown Hall Of Fame. Their traditional show wardrobe and effects are prominently displayed at the museum, in all their spangleland glory. 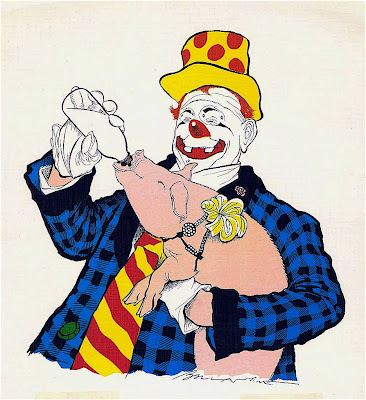 Joe liked to recall one of their most popular acts, "the hot doggie" - a clown steals hot dogs from a clown vendor and gobbles them down, then gets sick and has his stomach pumped by clown doctors and out comes a little dog! 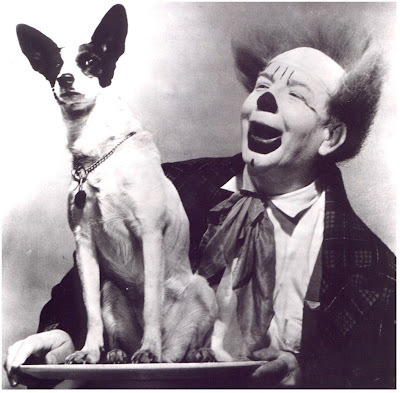 The audience cheers, the clowns take their bow and exit, followed by the dog walking on its hind legs. 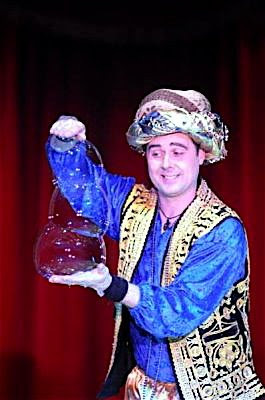 Right up until 2006 Joe made his yearly visit to the balloon vendor's convention in Las Vegas, and in his final years he hosted underprivileged children in special visits to any circus near his Tabaleen Lane apartment headquarters in Milford, Ohio. In 2007 Joe's health began to fail, and in March 2008 he made several trips to and from care facilities until a bout with pneumonia caused yet another hospital stay. He fell and broke his hip, requiring hip replacement surgery at Bethesda North Hospital on Montgomery Rd. in Cincinatti, Ohio. In the days that followed, Joe's health declined until he eventually entered his twilight sleep. 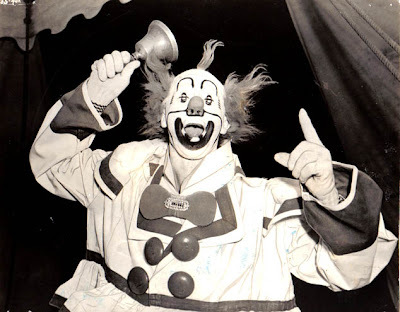 In his heyday Joe always had a cigar nearby (the only time he wasn't smoking one was when he was clowning in the show or appearing before fans), and was always fond of telling how he began smoking cigars in the first place. Joe, Chester and Kenneth Waite were playing the State & Lake Theater in Chicago (the Waite Trio opened the show). As it happened, George Burns and Gracie Allen were on the same show. Joe was sitting backstage when George Burns came off stage after the act, spotted Joe, and invited him to join the comic in the alley for some fresh air. The two walked a couple blocks to a cigar store. George went in, and came out with a handful of cigars and handed one to Joe, who informed the comedian "I don't smoke". Burns replied, "Go ahead and have one. You'll enjoy it." Joe did, "And that was the beginning of me smoking cigars!" In later years Joe gave up smoking, but always kept a stogie handy just for the feel of it, and the sweet aroma of the tobacco. He reminisced often, with fond memories of shows, towns, and countless friends from years gone by. Fond memories for a wonderful man; he was a sweet, simple man who took the world easily, always added a dash of dry humor, and was dearly beloved by his many friends and countless fans. 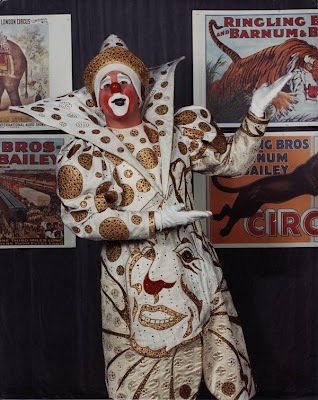 Historically, Joe Vani was the world's oldest living professional circus clown, and, very few would argue, the last of the pioneer American Circus Clowns. He is survived by one brother, Frank Vani in Florida and a niece, Marlene Lorenz, of Twin Lakes Wisconsin. There will be memorial service Sunday, March 30th in Twin Lakes. Burial will be in Twin Lakes Wisconsin. FELIX ADLER AWARDS: Important Update! After discussing it yesterday with several members of "The Academy" the decision has been made to change the name of the award for best duo, trio or ensemble from the PAUL JUNG AWARD to the CHESTER AND JOE SHERMAN AWARD. THE PAUL JUNG AWARD will be re-instated next year for best gag. The recent news about Joe's health and the fact that so many who have came before us have left without ever knowing how much of an impact their work has made on those of us that follow, I feel that it's really important to let Joe know this week how much he, Chester and ALL of the clowns of his generation have taught us. 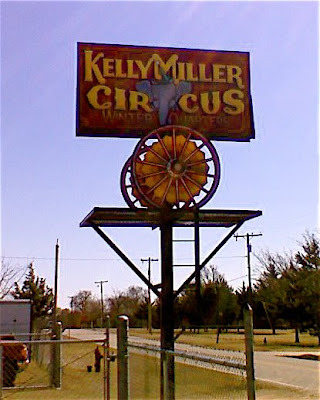 John Ringling North II (the nicest producer in the circus business) today presents America's One Ring Wonder, The Kelly-Miller Circus in Whitewright, TX. The show was baptised by a thunderstorm on Monday night, I was christened with mud looking for the new lot yesterday in Whitesboro. My GPS was directing me to the high school in Whitesboro and, in searching for the show, ended up getting the rental car (a Kia Piffle, South Korea's idea of a 3 cylinder muscle car) stuck in the mud. John Moss (America's nicest Ringmaster and Performance Director) was kind enough to send his wife Reyna and the show's mechanic with John's white pickup truck to tow me out. It was up to America's 21st Century American Circus Hero and rainy day RiverDancer, Casey Cainin McCoy to help get everyone unstuck and back on the lot by intermission of the 4:30 show. So this "building clown" has learned several new things about the "outdoor amusement" industry, not least of which is that AAA will not send a tow truck if the most accurate description of your location that you can provide is "field". "You can't miss me. I'm pretty sure that I'm the only red Kia stuck in the mud next to the high school tennis courts. If you see a guy chain-smoking and cursing like two drunken sailors, rocking back and forth and loudly spinning his wheels, digging himself in deeper... yeah, safe bet is that's probably me." So thanks go out to Casey, Reyna, John, our show's mechanic and to Mr. North today. For AAA? Meh, not so much. And if you're in Sherman, TX and see what looks to be an adobe car heading north towards the car wash at a little after the Days Inn's 11:00 AM check out time? That's me. Penn & Teller from The West Wing. I've always liked Penn & Teller; as time goes on I like them more and more. 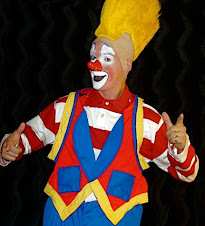 Looks like Felix Adler left some wardrobe in the "guest clown" trunk. Anyone know anything about this photo? My guess is that it would be from an indoor Shrine winter date with "townies" dressed in Felix's costumes. 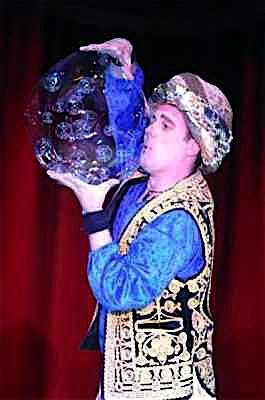 Who is that bubble blower currently mixing it up with the creme-de-la-creme of the circus world on Roncalli? 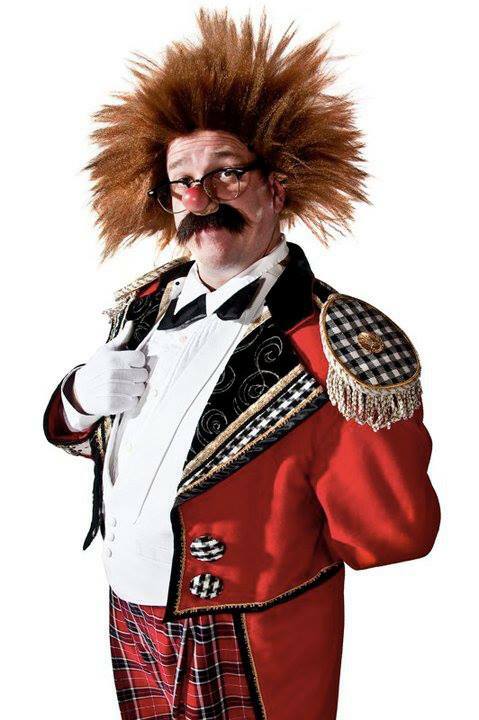 Why it's Clown College grad, former Ringling clown and past member of The Kelly-Miller Circus Clown Alley, Mr. Darren "Burl" Burrell. 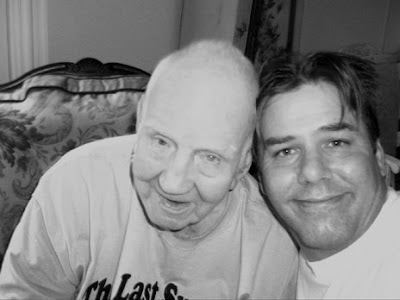 Just found out that Joe Sherman (Vani) has been moved into Hospice care at Meadowbrook Nursing home in Cincy. The phone number at the home is 513 489-2444. The address is 8211 Weller Rd, Montgomery OH 45242. He's not expected to last more than a day or so. He is permitted visitors 24-7. Thank you for the update Arte and I would hope that folks in the area would make the effort to stop in to see him and the rest of us would remember to keep Joe in their thoughts today. Just a reminder to get your votes in by midnight March 31st! This year's voting is much more fragmented last year and there seems to be a consensus vote in only one category so far. Cast your votes for the 2008 Felix Adler Awards by sending an email to me at cashincomedy@mac.com with your votes and the words 2008 FELIX ADLER AWARDS in the subject line. Voting will continue through Monday March 31, 2008. The winners will be announced on April 1st, 2008. After a day off due to torrential rains that had a good portion of the midwest gathering lumber and two of every animal John Ringling North II's One Ring Wonder The Kelly-Miller Circus moves to Whitesboro, TX today. Showtimes at 4:30 and 7:30 PM. The photo to the right was taken by me after pulling into KM Winter Quarters in the beautiful Red River Valley of Oklahoma on March 11th 2008. 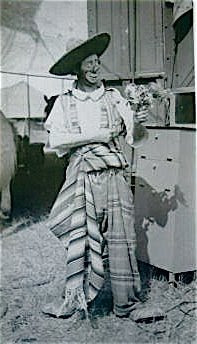 Just when I was starting to feel a little hinky about playing a mariachi in the 2008 Kelly-Miller aerial production number, along comes this 1930s era photo of Paul Jerome in big shoes, plaid pants and sombrero. This is the first of several pictures over the next few days that I found in some European circus books that I came across in the Hugo Public Library in Hugo, OK.
"It's a Mr. Larible on line 2 for you..."
John Ringling North II's Kelly-Miller Circus, America's One Ring Wonder has arrived in the greater Dallas/Ft Worth area and appears tonight for two performances in Royse City, TX. Bring your umbrellas and boots, it looks like it's going to be another wet one. 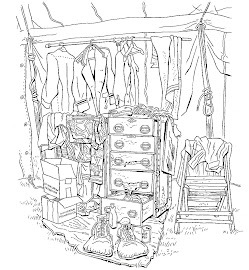 The show may have been blessed in Winter Quarters on March 14th but the 2008 season was baptised by a thunderstorm last night that hit just after the start of the 7:30 show. While many were complaining about the rivers forming behind the back door, Casey Cainan lept to his feet and literally danced with maniacal glee. 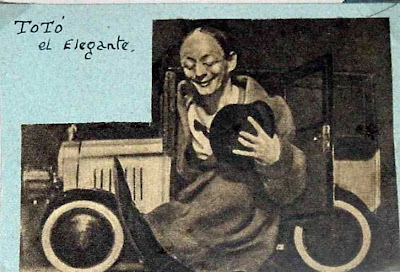 Paul Jerome (in whiteface makeup) in a photo that was used over and over in Ringling publicity of the 20s, 30s and even into the 1950s. 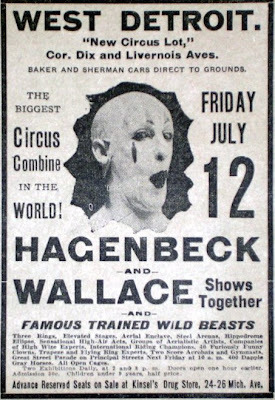 Art Adair featured in a 1907 newspaper ad for the Hagenbeck-Wallace show in Detroit, MI. 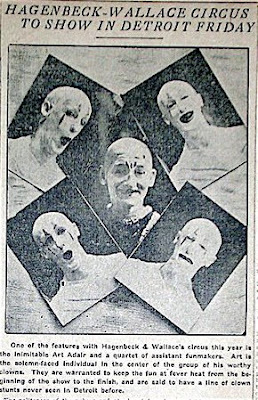 Taken from a Detroit area newspaper article for the same 1907 H-W engagement: The caption claims that it's a photo of Art Adair surrounded by four other clowns. Actually it's a photo of George Lafayette Fox surrounded by four shots of Mr. Adair. While the rest of you are off drinking Guinness, listening to The Pogues and whipping what's left of your shamrock shake at the head of a bagpiper, some of us will be working. Spending St. Patrick's Day in Honey Grove, TX looks to be about half as exciting as spending the Fourth of July in Canada. America's One Ring Wonder keeps rolling today with two shows at the Honey Grove South Elementary School Grounds presented by the Honey Grove Chamber of Commerce in cooperation with the local P.T.O. First 10 patrons in appropriate, circus-style, Stetson hats will receive a 25 pound bag of roasted circus peanuts courtesy of the Peterson Peanut Company of Cleveland, OH. Poodles Hanneford's photo from the 1932 Hagenbeck-Wallace program. 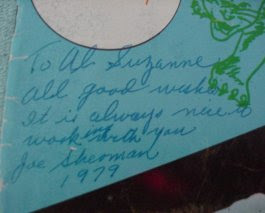 A 1979 Shrine Circus program with the cover signed by pin-up boy Joe (Vani) Sherman. Happy birthday wishes go out today to Larry Clark who was forced to wear this outfit in spec. on Ringling's 129th edition. Really, what kind of a maroon would be caught wearing an outfit like this? 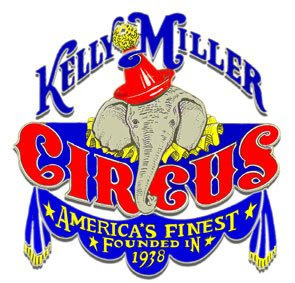 America's One-Ring Wonder, the Kelly-Miller Circus continues it's 2008 tour today with two shows in nearby Idabel, OK.
Showtimes at 2:00 and 4:30 PM. I was always under the impression that Armando "Toto" Novello was from Vienna, Austria but a New York Times obituary from December 16, 1938 that I recently found gives his country of origin as Switzerland. 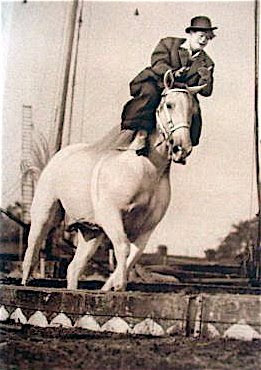 He was born October 27, 1888 to George Novello, a circus horse trainer, and Amalie Shoenberg a lion tamer. 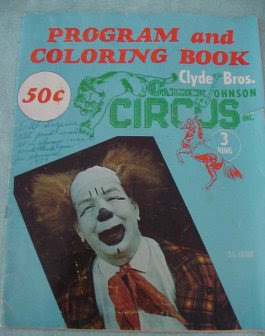 He began performing early and was clowning in circuses by age 18. He was seen by Charles Dillingham while in London in 1914 and brought to America to perform at the Hippodrome in New York. He had a successful career her in the States, performing on stage, in circus and briefly as the star of his own film series. 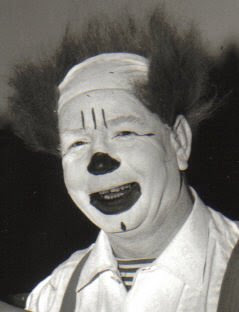 Toto created the midget clown car prop that was later perfected by Lou Jacobs. 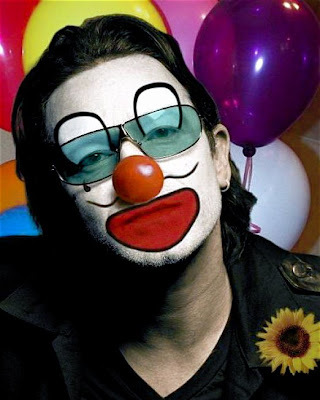 Unlike his Hippodrome clowning contemporaries Frank "Slivers" Oakley and Marceline Orbes, Toto seemed to have been financially secure and owned a spacious 10-room home in Larchmont, NY. Just like Slivers and Marceline he died much too soon. He passed away at the age of 50 following surgery for an intestinal condition at Union Hill Hospital in the Bronx. If you'd like to see old newsreel footage of Toto (and his midget car) performing at a January 1, 1930 benefit circus for German police officers and their families please click the title of this post.